By Prof Paula Giliker, Professor of Comparative Law (University of Bristol Law School) and President of the British Association of Comparative Law. Professor Bernard Rudden DCL, LLD, FBA was Professor of Comparative Law at the University of Oxford from 1979-1999 and Professorial Fellow of Brasenose College, Oxford. On 6 September 2016, the British Association of Comparative Law (BACL) held its annual seminar in his honour at St. Catherine’s College Oxford. Its theme was: ‘Bernard Rudden – Comparativist, Legal Scholar, Polymath’. 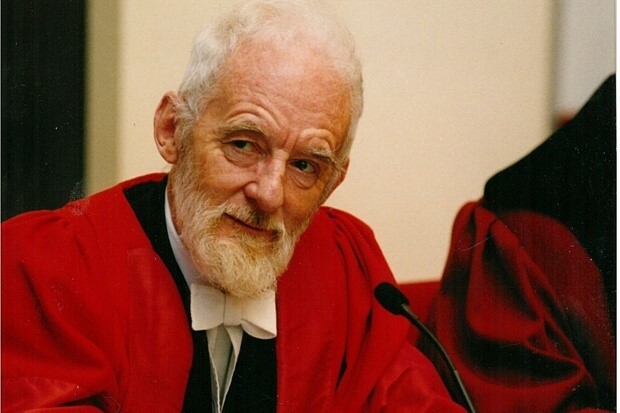 Professor Rudden, a noted comparative private lawyer, passed away on 4 March 2015, aged 81. His obituary in The Times newspaper described him as a “legal polymath who published extensively on Soviet law”, but the seminar sought to go beyond this succinct description and identify not only Rudden’s contribution to comparative law scholarship but also his impact as a friend, colleague, teacher of law and mentor to numerous comparative law academics. Bernard Rudden’s work had been recognised on his retirement from the Oxford Chair of Comparative Law with the publication of P. Birks and A. Pretto (eds), Themes in Comparative Law: In Honour of Bernard Rudden (OUP, 2002). BACL was delighted to be able to invite three speakers who had contributed to this volume: Professor John Bell, Professor of Law at the University of Cambridge, Professor Simon Whittaker, Professor of European Private Law at the University of Oxford, and Professor Geoffrey Samuel, Professor of Law at the University of Kent and Professor affilié at the Ecole de droit de Sciences Po, Paris. The fourth paper was delivered by Dr Andrea Loux Jarman, a former student of Bernard Rudden at Cornell Law School where he was a visiting professor and now Senior Lecturer at Bournemouth University. The learned audience included Professor Birke Häcker, recently appointed Professor of Comparative Law at the University of Oxford and Professor William Twining, Emeritus Quain Professor of Jurisprudence at University College London. The contribution of Professor Bernard Rudden to comparative law is outstanding. I was fortunate to be present at the 1998 Congress of the International Academy of Comparative Law which was held in the Wills Memorial Building at the University of Bristol. Bernard’s paper explaining “gentlemen’s agreements” to a somewhat disbelieving civil law audience was exceptional and gave a valuable insight to civil lawyers into this curious aspect of the common law. For tort lawyers also, his famous article ‘Torticles’ (1991-1992) 6/7 Tul Civ LR 105 was notable for dissecting common law tort law methodology and reasoning in which he commented famously that “the alphabet is virtually the only instrument of intellectual order of which the common law makes use.” To this must be added his work in the law of property, legal history and company law, notably in his seminal monograph, The New River: A Legal History (Clarendon Press, 1984), and his student textbooks on EU law, property law and French law. Bernard was also a leading scholar on Soviet tort law (the topic of his PhD). While the speakers at the seminar acknowledged that to a contemporary audience the work of Bernard Rudden might now be regarded as ‘traditional’, this did not signify that his work was no longer relevant nor that there were not lessons to be learnt for the modern comparative lawyer. Professor John Bell in his excellent paper ‘In praise of micro-comparison’ highlighted the nature of Rudden’s work. “Bernard Rudden was,” he stated, “par excellence a person who used the micro detail in order to provide wider lessons. But I think his approach does show the broader value of micro-comparison with its grounding in the reality of the way in which the law operates”. His work indeed grappled with big themes, such as the role of law in the economic system of western capitalism and the role of legal rules in legal practice, but did so in a way which explained clearly to the reader the nature of the legal problem in question and how the law of each system dealt with the issue. Professor Simon Whittaker (a former DPhil student of Professor Rudden) in his thoughtful paper ‘Ius cogens, ius dispositivum and unfair terms’ took his theme from one of Rudden’s most celebrated articles and gave a master class of how detailed examination of EU and domestic law relating to unfair terms can provide a modern insight into the operation of mandatory and non-mandatory rules. For Professor Geoffrey Samuel, Bernard Rudden’s contribution should be viewed more broadly. Rudden was a genuine polymath who, in particular, had an interest in film. In his paper, ‘The paradigm case: Is reasoning and writing in film studies comparable to (or with) reasoning and writing in law?’ (now published in No Foundations: An Interdisciplinary Journal of Law and Justice 13 (2016)), Samuel highlighted the benefits of inter-disciplinary study and the insights which might be gained from examining the law from a different perspective. Andrea Loux Jarman was able to provide a more personal contribution, describing her contact with Bernard Rudden when he came to Cornell Law School as a visiting professor with his wife, Nancy. As a student, she found him willing to engage with both Faculty and students, but also keen to learn about the history of New York and the impact of the religious revivals of the early nineteenth century (‘Professor Bernard Rudden in the Burned Over district: His life and contribution to Cornell Law School’). The picture therefore was of a dedicated academic, committed to his work and students, but also willing to look outside law for inspiration. A polymath indeed. Professor Bernard Rudden was an inspiration for many academics, both UK-based and overseas. As a former student of Bernard and President of BACL, it was a great honour to organise this seminar to celebrate his life and work. In praising his contribution to comparative law, the BACL seminar sought both to remind us of the work of a noted and much-liked scholar, but also to make us as academics reflect on how we engage in comparative law research in the twenty-first century.